250 years ago on July 2nd 1767, a young boy high in the crow’s nest of the HMS Swallow, shouted "Land Ahoy" and Pitcairn's Island was first sighted by a European. Midshipman Robert Pitcairn, aged just 15, was praised by his captain, Philip Carteret, and had the Island named after him. History poses the question that in 1606 the Portuguese explorer Pedro Fernandez de Quirós first sighted Henderson Island and possibly Pitcairn but the consensus is that this may have been a sighting of another of the Pitcairn Group. Robert Pitcairn's sighting has stood and the Island remains a British Overseas Territory. Robert Pitcairn was born in Fife in 1752 and became a midshipman in the Royal Navy at the age of 14. His father John was a major in the Royal Marines and commanded forces in the battles of Lexington and Bunker Hill during the American Revolutionary War. The young sailor first served on the HMS Emerald and then joined the Swallow in July 1766. The ship's pay-book listed him as aged 19, but baptismal records show he was only 14. The ship, a 14-gun sloop, sailed under Carteret on a voyage of exploration in the South Pacific, accompanying HMS Dolphin. The two ships were parted shortly after sailing through the Strait of Magellan with Carteret taking a more southerly route through the Pacific Ocean, failing to find much new land, while Dolphin took a more northerly route and became the first clearly documented European vessel to land at Tahiti in June 1767. On Thursday, 2 July 1767, Pitcairn was the first person on the Swallow to spot an island in the Pacific. The island was described by Carteret as "small high uninhabited island not above 4 or 5 miles round ... scarce better than a large rock in the Ocean". High volcanic cliffs prevented the voyagers landing on the island. Carteret erroneously recorded Pitcairn's location at 25°02'S 133°21'W 25.033°S 133.350°W. These incorrect co-ordinates meant that the island could not be found again by later voyages as it lies 327.4 kms (203.4 miles) further east. The 3° longitude error may be explained by Carteret sailing without the benefit of the new marine chronometer. This error was used to good effect by Fletcher Christian and the Bounty mutineers who, realising the mistake, established residence on Pitcairn with the plan to avoid detection. Robert Pitcairn arrived back in England on the Swallow in March 1769. He left the Swallow in May 1769, and joined the HMS Aurora, a 32-gun frigate, commanded by Captain Thomas Lee. 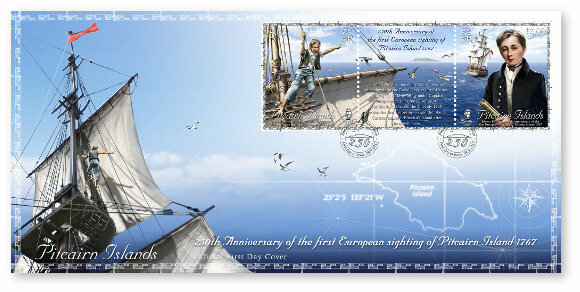 They sailed from England in September and called at the Cape of Good Hope in December 1769. The ship made for the Comoros Islands but disappeared without trace. It may have been sunk in a tropical storm, or wrecked on the Star Bank off the south coast of Madagascar in early 1770. Collectors may be interested to note that the illustration of Robert Pitcairn in formal attire is a stylised depiction by Lucas Kukler. Our research failed to find any image of the young midshipman. The designer took the age of the sailor and an image of his father and created what we consider a remarkable “possible” likeness. 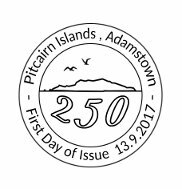 2017 PREMIER EDITION - This limited print run of just 200 packs is now available and features the "Robert Pitcairn" issue. Further details of these sought-after colour separations and progressives can be found here.